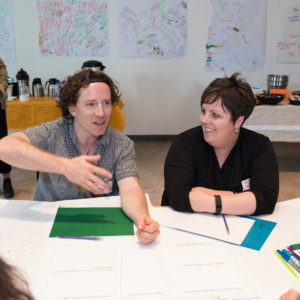 This two-year project will significantly and sustainably increase connections between Quebec’s English Arts & Culture sector (organizations & artists) and Community & Education partners in all regions. ELAN’s ACE Initiative will ensure that more schools and communities can access arts and culture to benefit from the creative stimulus that these activities provide in the English language. How? In three phases: DESIGN! TEST! SCALE! DESIGN! ELAN brought 50 participants together for ACE JAM, a design and planning gathering on June 2, 2016. ACE JAM opened the first phase in this project to establish sustainable connections among partners across Québec. Attendees brainstormed ideas for concrete pilot projects that would unite communities, artists, and educators. We are very excited about the quality of the projects proposed during the ACE JAM event. ACE JAM generated some very high-quality proposals that should have exciting results. See photos from ACE JAM on Facebook! TEST! ELAN will actively support implementation of selected pilot projects. Communities in four different regions will test the projects with start-up funding and coaching to develop the strongest, most adaptable projects possible. SCALE! ELAN will promote successful projects that can be replicated in other communities and schools throughout Canada. Let’s make a real difference in the lives of students, communities, and artists! To stay up to date on the project, email ace-initiative@quebec-elan.org with ACE in the subject line to be added to the ACE Initiative email list. This project has been made possible by the Government of Canada and the Roadmap for Canada’s Official Languages 2013-2018: Education, Immigration, Communities.